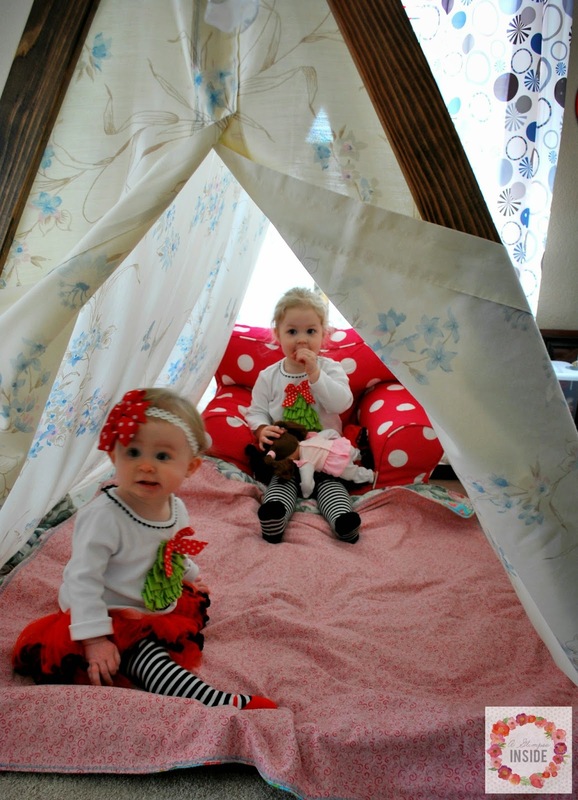 I have been wanting to make the girls a tent or teepee for quite some time now and decided that it would be a fun Christmas gift. My grandfather passed away at the beginning of September and I asked my mom to bring home all his sheets so I could use them as fabric. 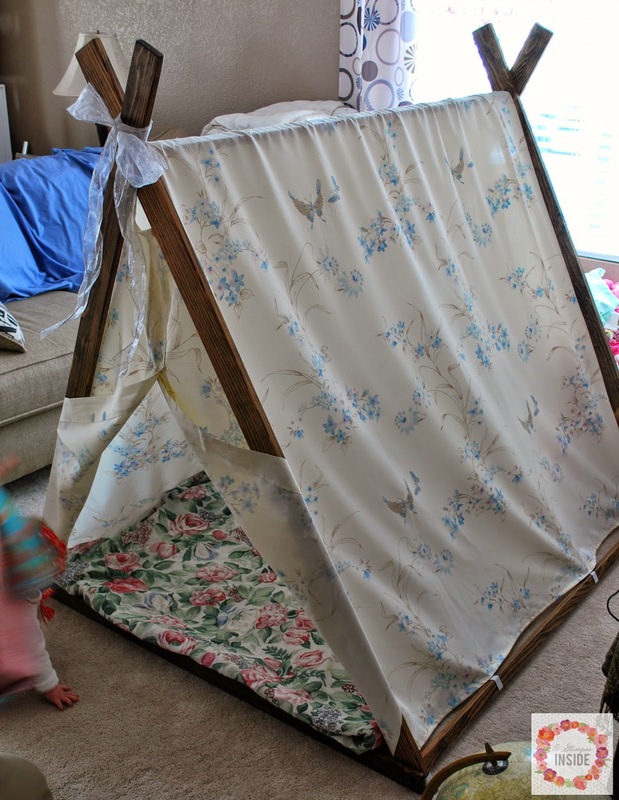 I got a whole trash bag full of awesome fun vintage florally sheets so when I talked to Travis about building a tent or teepee, I knew I would want to use some of the sheets. After talking, we decided to make a tent for the girls and that way we could take it down really easily and pop it back up. So on December 23rd, yes, just 2 days BEFORE Christmas, we finally got started on this project! 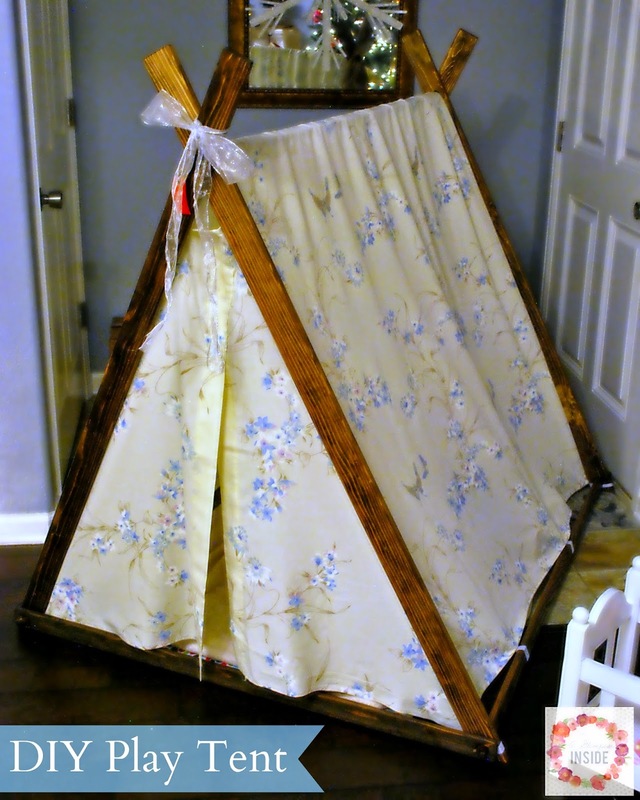 Travis built the tent the 23rd and I spent all day Christmas Eve sewing the fabric. Eek! Nothing like waiting until the last minute! But I love how it came out. Unfortunately, I do not have full step by step instructions for our tent but I can give you a basic run down on it. -For the front posts that make the tall frame of the tent we used- 4, 2 x 1/2 boards cut to 5 feet 1 1/4 in. -For the front and back braces at the bottom of the tent they are cut 4 ft long. -And lastly the side bottom braces and top on in the center brace is 4 ft. 10 inches. 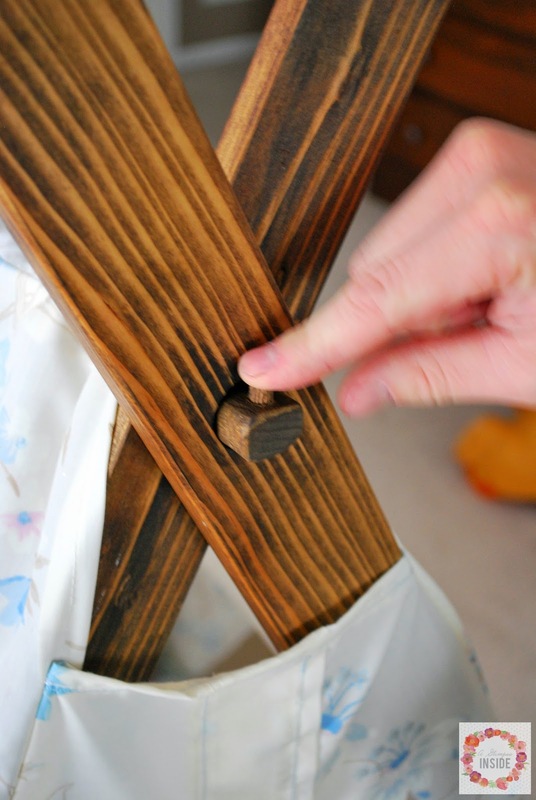 Travis used 1x1s but dowel rods would work perfectly as well. 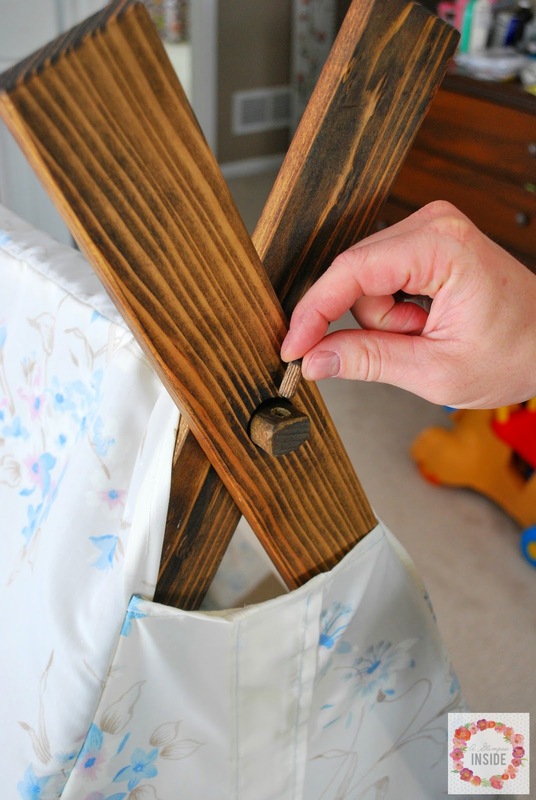 You will also need small peg dowels that you use for joining furniture. Travis cut all the pieces to length, then drilled holes in the posts and front and back braces. Then since he used 1x1s for the side bottom and top brace, he had to sand them to fit through the holes... hence why a dowel rod would be perfect. He used wood we had on hand. In the top brace and the side bottom braces, he drilled small holes near the end of the board to place a peg so the boards wouldn't slip off the ends while the girls were playing and it fall on their heads. 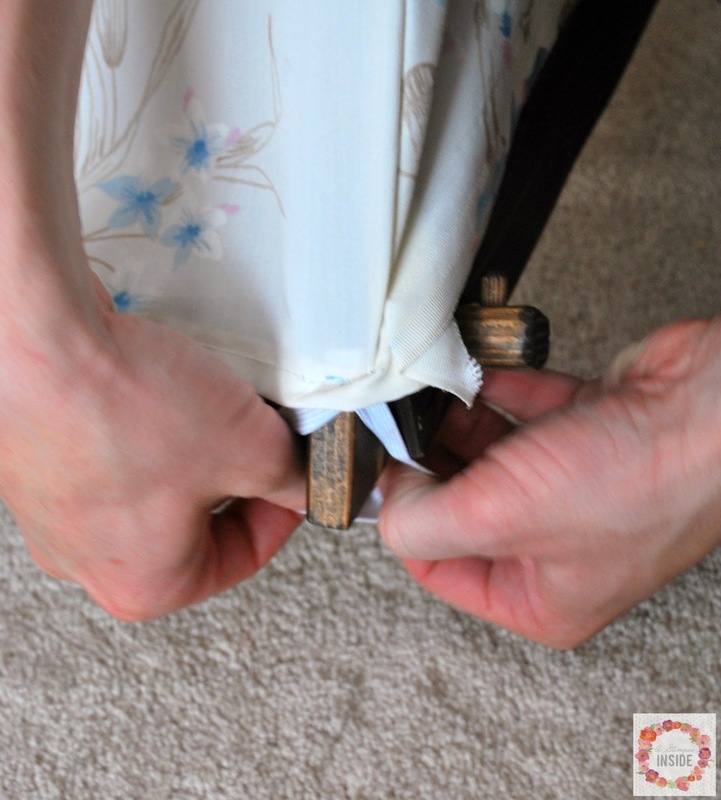 When it came time for me to sew the fabric, I searched through the sheets to figure out what to use. There was a duvet cover in there that my grandma had sewn out of two sheets so I decided to use that since it had the most fabric. I used 2 full size flat sheets and I was able to cover the sides AND make the front and back pieces as well. 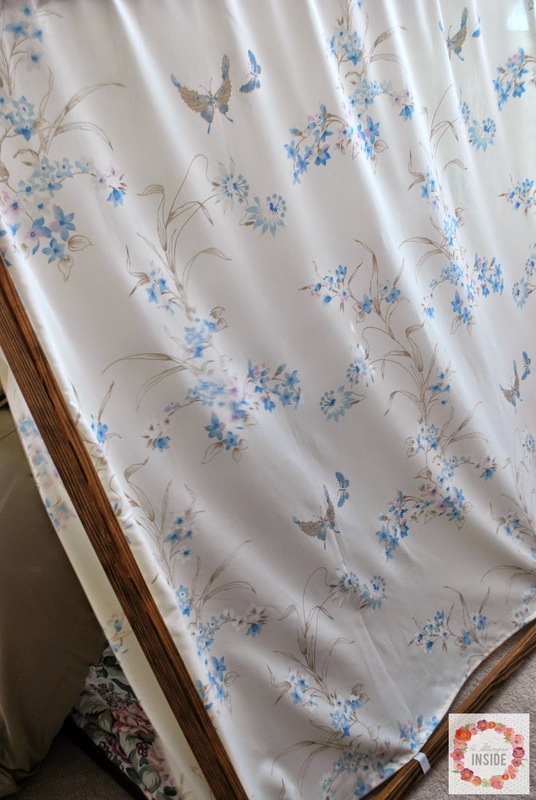 It has a brown, blue and pink floral motif on it with some butterflies flying as well so I thought it was cute for them. I sewed the seam on top first of the two large pieces. I then placed it on top of the frame and trimmed it to the proper length. Removed it and sewed the seam on the bottom. For the front and back pieces in the triangles, I used what would be the very top of the flat sheet where the sheet is folded over into the large seam. I had two pieces since I was using two sheets and when I trimmed them off the large pieces, they were the perfect width for the opening and back enclosure. This is where I was REALLY winging it! REALLY!! I was so incredibly frustrated at this point but manage to figure it out. I placed the triangular frame over the fabric on the floor and trimmed it to the shape to have the correct shape. Give yourself extra for seam allowance. Then, I placed the large seams on top of each other to create one line down the front and back and sewed them together. Too attached the panels on the walls, I laid it all on the floor to pin, right sides facing each other and pinned it. I pinned on half of the triangle to the wall then folded the triangle on top of itself and folded the wall side and pinned that so I was sewing it all at once without having to repin. I am sure there is an easier or more proper way to do this but it worked for me. I left a space at the top of the door flaps and the back flap instead of sewing it completely closed so heat could escape from the top of the tent. Which was a good thing... it gets hot in there! Lastly, I sewed some elastic in a loop at each corner and then two at the bottom of each wall panel. You could always create a pocket at the bottom of the wall panels to slid the braces through but I choice to do it this way instead. 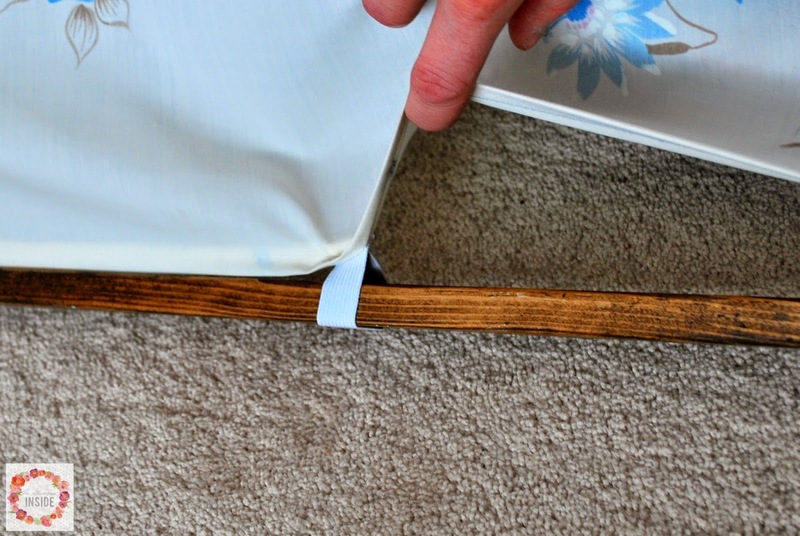 The elastic just slips over the wood frame to keep the fabric in place. 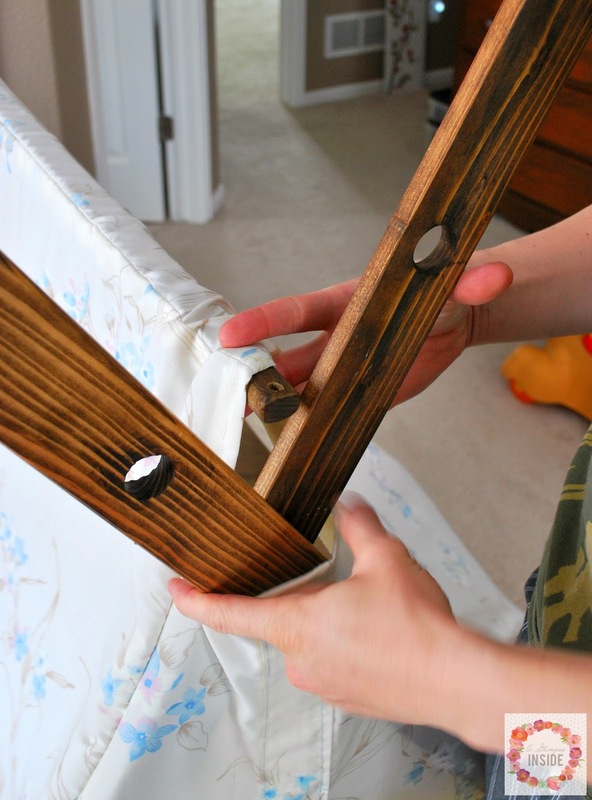 Then the side braces slip through the elastic on the wall panels as you are putting it together to keep the fabric tight. 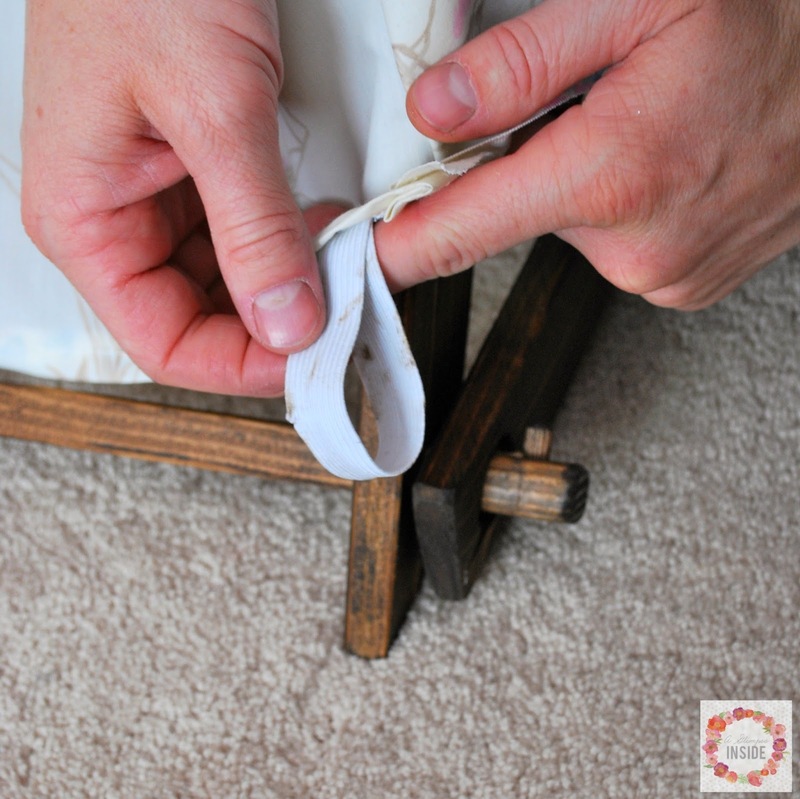 The top center brace goes under the fabric and if you leave the space in the front and back panel, you can even slip the frame on the inside of the tent as well instead of seeing it on the outside. The girls absolutely love it!!! They play in it all the time and it is so cute hearing them giggle at each other while they are in there. Only change, I think I might add some ties to the doors to keep them open better. We'll see! You can check out Make It and Love It for a great tutorial with step by step instructions, especially the sewing part since I winged it.